An overhead electric power line exploded and when it hit the ground the live wire started a fire. 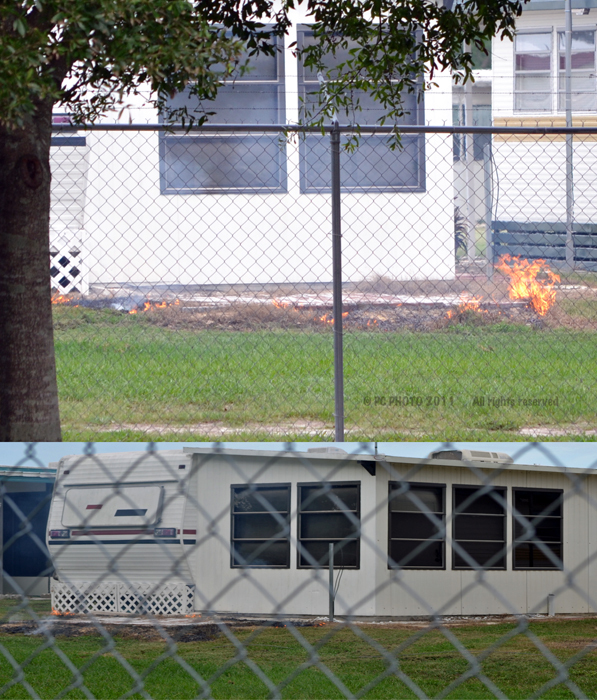 The grass caught fire behind an unoccupied trailer and there was no quick way to get on the other side to try and knock down the flames. No one was on the other side of the fence because this is a campground occupied by snowbirds in the winter months. A group of people had gathered and I shouted back to to call the fire department. While waiting for the fire fighters I started taking pictures in the event the owners of the trailers needed documentation of any damages. Thankfully the fire burned itself out by the time the fire fighters arrived and none of the trailers were damaged. Property owners and land developers often erect FENCES to protect their interests and it’s not always a good idea.